Prepare for the adventure of a lifetime! We’ll meet at the beautiful lakeside of Bayano Adventure, a few kilometers on paved road from the Pan American highway. 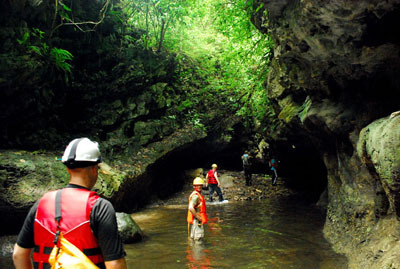 You will be met by your guide who will provide you with a lifejacket and your helmet with a light for use in the cave. Our local boat captain will take you on a relaxing boat trip that lasts approximately 30 minutes, around the islands of Lake Bayano and to the caves. We will hike a short distance to the cave entrance. Once inside the cave we will be walking through water and over rocks, sometimes in complete darkness! We will go deep into the cave to see the rock formations, pools of water, some filled with hundreds of tiny fish, various colorful frogs and most importantly, hundreds and hundreds of bats! At several locations, the ceiling of the cave opens and you will be standing in amazing shafts of pure sunlight that illuminate the cave and all its wonders. You will be led by the guide who will make sure everyone has a safe and enjoyable experience. We will be in the cave for approximately 2 hours, so there is plenty to see! Following the visit to the cave, you will enjoy a simple but delicious lunch while observing some of the hundreds of bird species that call Lake Bayano home and, very likely, howler monkeys! an enthusiasm for Nature’s beauty! Additional Information: We normally only accept parties of four people or more. A large portion of this tour consists of walking and exploring inside the cave’s uneven terrain made of sand and rocks, some areas can be very slippery. Depending on the level of the lake some of the pools inside the cave can reach depths of as much as 5 or 6 feet.